KOKOMO, Ind. – Kokomo High School has a rich history of boys basketball. From Mr. Basketball’s Tom Schwartz and Jimmy Rayl to the 1961 state champions to the 2011 state runners-up, Red and Blue Nation has seen just about everything on the hardwood. But on Friday night, 3,000-plus fans in historic Memorial Gymnasium witnessed something only one other Kokomo team had accomplished – a clean slate through the North Central Conference. Following a hard fought, blood drawing, classic NCC tussle with the Red Devils of Richmond, Kokomo fans celebrated a 59-50 victory, and with it, an outright NCC championship. This contest was not for the faint of heart. From a lackluster 9-9 first quarter draw – which resembled two prize fighters feeling each other out – to an eight point third quarter Richmond lead, to Class 4A No. 9 Kokomo calling a timeout to wipe the blood off junior Tayler Persons face so he could shoot free throws, this game had fans sitting on the edge of their seats before jumping to their feet in excitement. After a near first half draw – Richmond led 18-16 – the Red Devils made a move and led 30-22 midway through the third stanza. But Persons told McCauley that he wanted the ball in his hands, and he drained a couple of 3-pointer, drawing the Kats to a 30-30 tie after three. “That kid, wow,” was all McCauley could say of Persons attitude and game. Two minutes into the fourth quarter, Richmond ended a Kokomo 10-0 run, and at the four minute mark the Kats held a slim 36-35 advantage. But Persons came up big once again, draining a long 3-pointer, and after losing his dribble and getting trapped in front of the scorer’s table, he leapt and rifled one of the best passes of the season to a streaking LaBradford Sebree who laid the ball up for a 41-35 lead. Kokomo then hit 7 of 10 freebies in the final minutes to secure the coveted title. Persons said this was the best high school game he has ever played, and the final statistics tend to agree as he finished with a double-double. The 2014 Indiana Mr. Basketball candidate hit 6 of 9 shots (3 of 4 from beyond the arc) for a game-high 21 points and grabbed another game-high 10 rebounds (six offensive). He also had three assists and six steals. “It is one of the best games I have played in my life,” said Persons, who was cut below the eye in the fourth quarter but still played all 32 minutes thanks to a series of timeouts which allowed Wildkat trainer Brett Patterson time to patch him up. “It was a battle – I thought I was playing football out there. There whole team is athletic and physical and our team didn’t back down. Man, I love my team. 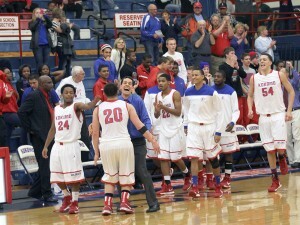 Kokomo’s victory is the 17th NCC boys basketball title and 11th outright championship for the program. The only other Kokomo team to run the table on the conference was Basil Mawbey’s 1995-1996 squad – the same Kokomo team that a young Brian McCauley starred on as a senior. Persons would be the first to point out it takes a team to win a title, and he was not alone on the court. Erik Bowen turned in another solid performance with nine points and five rebounds, while LaBradford Sebree scored eight and Mykal Cox had a game-high four assists. For Richmond (14-7, 5-2), Charles Hampton scored 17 points and Joel Okafor added 12. Kokomo (18-2) has no time to rest as they host to a very talented Fort Wayne Northrop (15-5) squad next Friday night. And the following week, it is IHSAA tourney time at the Lafayette Jefferson Sectional. But for now, this group of Kats will savor something that only two of Kokomo’s 110 boys basketball teams have accomplished – a perfect season in the prestigious North Central Conference. This entry was posted in IHSAA, Kokomo, North Central Conference, Richmond. Bookmark the permalink. GO ALL THE WAY WILDKATS!